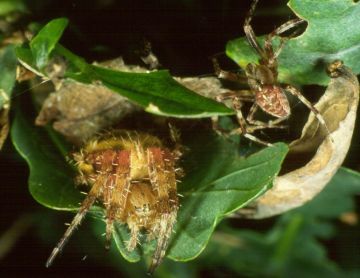 A large and distinctively marked spider found in a wide range of habitats wherever the habitat can provide supports for its large and conspicuous orb web, such as all types of woodland, scrub and other vegetation, hedgerows and roadside verges, buildings (sometimes inside) and gardens, as well as heathland, quarries and cliff-faces. It spins large orb webs up to 40 cm across at heights of between 1.5 m and 2.5 m (Jones 1983) in shrubs and tall herbaceous vegetation. Both sexes are mature in late summer and autumn, females surviving through to late autumn. It takes two years for the young spiderlings to reach maturity in Britain, and immatures may be found throughout the year.